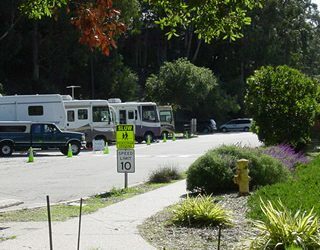 Santa Cruz Harbor RV Park is your premiere destination for RV-ing in the Santa Cruz area. Located in the Santa Cruz North Harbor, you can enjoy convenient access to numerous beaches and restaurants, downtown Santa Cruz, Capitola, and the Santa Cruz Beach Boardwalk. Harbor beach is approximately 1 mile from the RV parking sites. A free water taxi between the north harbor and beach area is available between 11:00 am – 6:00 pm on summer weekends and holidays, from Memorial Day through Labor Day. 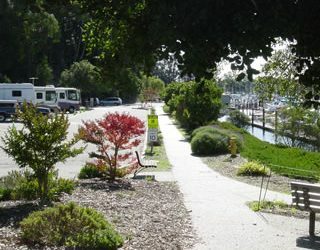 An extensive walking trail completely surrounds the harbor. An RV host is available for information and initial registration. Please call (831) 475-3279 and leave a message for reservation inquiries and additional information. Please do not attempt to make contact with the host after 9:00 pm or before 9:00 am. Please call (831) 475-3279 for reservations. A maximum overall length of 42’ is allowed. The fee for overnight RV accommodation is $52/night with hookups. Sewer, electric (30 and 50 amp), and fresh water are available at each site. There is a seven night maximum stay. Checkout time is 12:00 noon the following day. Dogs are welcome but must be on a leash at all times. Reservations are accepted by phone or in person, with payment due in full, in advance. Permits are required for additional vehicles, or use of other parking spaces. Fees are based on the type of permit required. Permits may be obtained from the park host or at the harbor office. Vehicles must be completely self-contained, including gray water. Access to the harbor docks and restrooms is not granted with your RV permit. Showers are not available. Cancellation Policy: Please contact the park host by noon at least 72 hours prior to your arrival to cancel/change reservation. Cancellations received with less than 72 hours’ notice will be assessed a fee of $52.50. The park host may be reached at (831) 475-3279.